Sit back and relax; this will be fun! Despite being a commercial flop when it released in theaters, John Carpenter's The Thing remains an influential, landmark piece of science-fiction/horror cinema, a paranoid masterpiece with a seemingly inexhaustible ability to spark discussion and analysis. Based on the novella "Who Goes There?" by John W. Campbell, the premise is as simple as it is flexible. There are many ways to read the narrative and many allegories to pull out of the subtext, but the genious of The Thing is that it is general enough to transform itself into whatever theme or moral you wish. I've watched the film more times than I care to admit. Regular readers know that diving into subtext is one of my favorite passtimes, along with finding unique spins on narratives that explain events in unexpected ways. Perhaps this is why I'm so obsessed with The Thing: it's playing my kind of music. I've encountered plenty of fan theories and various academic analyses of the film, some more compelling than others. Today, I'm going to go over my personal favorite theories about the story, amalgamations of my own observations and those of others (with a special shout-out to Rob Ager's Collative Learning). I will also take the time to debunk some of the more pernicious and annoying theories out there that constantly pop up whenever anyone discusses the film. What I won't do, however, is get too deep into any thematic analysis, as the general consensus seems to fall into one of three camps--this is either a political allegory, an examination of masculinity, or a commentary on the rising AIDS scare of the time--but if you take those interpretations to their logical conclusions, this is an even darker and more subversive film than it appears. I want to have fun here, not get into thorny sociopolitics. The film invites you to theorize about its story, because it sets up the problem so well and offers so much ambiguity that it dares you to try to figure everything out with your own skills of observation and deduction. Almost always, it boils down to a single question: in the famous final scene, who, if anyone, is still human? John Carpenter made this question all the more maddening by confirming that one of the survivors is, indeed, a thing, but he won't say which one. You can dismiss it as a deliberately ambiguous ending with no right or wrong answer and call it a day, but even though you'd probably be correct, where's the fun in that? I'll get to my interpretation about the final scene a little bit later, but before we can discuss the wonderful moment when MacReady passes Childs the whiskey bottle and then quietly chuckles to himself, we have to start with some basics. When it comes to assimilation, the most extreme possibility is posed by Fuchs after studying Blair's detailed notes. 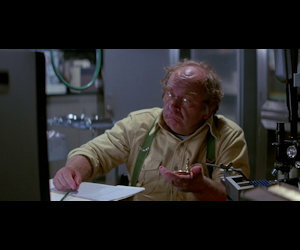 Blair's notes suggest that a single alien cell is all it would take for the thing to take over a host, and Fuchs expounds upon this to MacReady by suggesting everybody in the camp prepare their own meals and eat out of cans, just in case the thing is leaving stray cells in the food supply. If this is true, then the likelihood of anyone making it out without becoming infected becomes extremely low. If we assume the single-cell hypothesis is correct, there's evidence within the film to demonstrate that virtually everybody is infected by the end, no matter how careful they are with the food. In the blood test sequence, Windows uses a scalpel to slice into everybody's finger, but critically, we never see him sterilize it between test subjects. In fact, right before he cuts himself for the last sample, we see him wipe the previous subject's blood off on his pants, hardly the most medically sound sanitizing solution. The assimilation need not be instantaneous, either. Consider the possibility of Blair getting infected relatively early, during his autopsy of the dog-thing. Perhaps he doesn't immediately transform, but he knows he's infected. Therefore, when we see him timing that wonderfully eighties computer simulation of an alien cell taking over a couple of dog cells, he's trying to figure out how much time he has left to be human. He then smashes the radio to protect the outside world and doesn't finish his transformation until he's alone in the bunker outside, contemplating suicide. If we suppose it would take more than a single cell to begin the process of assimilation--a supposition without much evidence--then it's more plausible for someone to make it to the end as a fully-fledged human. That's when we can talk about Childs and MacReady facing off against each other in the snow, when there's a distinct possibility that one or both of them is not a thing or won't become one in the very near future. Let's start by debunking one of the most popular theories out there: that the whiskey bottle MacReady passes to Childs contains gasoline rather than whiskey, but Childs, as a thing, is incapable of noticing this. 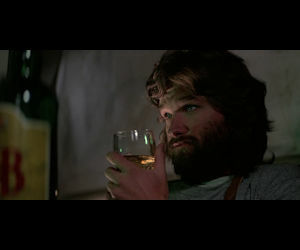 I get why this is compelling on the surface: MacReady is never seen drinking out of the bottle (he does look like he's about to drink out of it when Childs arrives, but perhaps MacReady is preparing to commit suicide), and during the climax moments earlier, he is using whiskey bottles filled with gasoline as Molotov cocktails. Unfortunately, the logic against this theory greatly outweighs the logic in favor of it. For one, we see the Molotov cocktails get destroyed by the thing. Second and more importantly, there's absolutely no reason to believe the thing would be oblivious to gasoline: it has functioning human organs along with the intellect and knowledge of the host, so of course it would know if it were drinking gasoline. That raises an interesting point, though: if the thing can present a perfect copy of its host, including its attitudes and behaviors, is it possible a person could be a thing and not know it? Or, to put it another way, what is the functional difference between a man and a perfect copy of him? The thing is probably just mimicking behavior and can stop doing so at any moment, as the Palmer-thing does once it fails the blood test, but is it possible that, up until that moment, the copied brain within the Palmer-thing was operating under the assumption that it was really Palmer? That might explain why Palmer passes up the perfect opportunity to be alone with Windows a few scenes earlier (assuming he was already assimilated at that point) or why the Norris-thing declines the offer to be in charge mere moments before its alien identity is revealed. Alternatively, perhaps the thing doesn't want to assimilate everyone, but I'll save discussions about the thing's potential motivations for the end. Another good question is: can one thing recognize another? Say there's three people in a room and two of them are things: do the things realize their advantage, or does each assume it is alone? This raises the possibility that Childs and MacReady are both things in the end but don't realize it. If MacReady is a thing in the end, though, why does he kill the Blair-thing? The most likely answer as I see it (though not the only possible one) is that he isn't a thing when he kills Blair, but becomes one immediately afterwards, possibly assimilated by the missing Nauls, whose ultimate fate is never revealed in the film, or by Garry, who may or may not be part of the giant Blair-thing that attacks MacReady. He could even be assimilated by some other thing, like one of the many dogs whose corpses are never burned (indeed, in a deleted final shot, a dog is seen fleeing the burning camp as the storm clears and the sun rises). This is all speculation, of course, but I put the odds of MacReady being a thing much higher than most, at 50%. As for Childs, there is plenty of room for him to have been assimilated. It's possible everything happens exactly as he explains to MacReady--that he went chasing after what he thought was Blair, got lost in the storm, and only made it back when the place was a giant beacon of fire and fury--but it seems odd that he would run out like that, leaving the door ajar. A lot of people think he's wearing different clothing, too, but it doesn't look that way to me (his clothing is merely coated in a layer of frost and snow, as would happen after half an hour in an antarctic storm, and his coat is so dimly lit by fire that it looks a different color). They also rely on dubious bits of evidence like whether his breath is visible (which is meaningless as the Benning-thing is seen with clear breath in the cold, but also, yes, you can see his breath) or whether there's a gleam in his eye (don't get me started on this easily debunked notion). 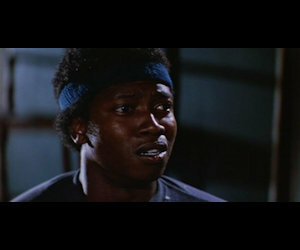 Regardless, Childs is obviously suspicious, and there's nothing revealed by the film to alleviate that suspicion. I put the odds of Childs being a thing also at 50%. How come nobody ever seems to ask what happened to poor Nauls? If we take Carpenter at his word, then, and assume one and only one of them is a thing, it's a coin-flip. 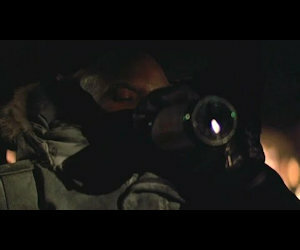 At face value, MacReady is merely laughing at fate or at the trust Childs is showing him by drinking from the bottle. But maybe he's laughing because he knows something the audience doesn't. Maybe he's just infected Childs with thing cells, or maybe he's found a clever way of determining Childs' true identity that we haven't thought of. It's impossible to know for sure, and I don't think there's enough evidence in the film to point in either direction. By my reading, though, they're both things, or at the very least, will become things very shortly. I think it is virtually impossible for them to still be uninfected, and if I were in a pair of their shoes, I would have to insist they burn themselves to try to save the human race. Then again, if the thing is as clever as it appears (and it certainly appears to be clever), then it probably has a backup plan already in place. Assuming motivations for the alien creature is problematic in and of itself, but let me just gloss over that for a moment. We know the thing can survive being frozen for incredibly long periods of time--just because that's the condition in which it was originally found--so MacReady's conclusion that it just wants to "go to sleep" by freezing itself seems perfectly sound. If it has the knowledge of anybody it's assimilated over the course of the movie, then it knows a rescue team will inevitably come along and scour the ruin of the base, finding any corpse it leaves behind. While MacReady and company are busy chasing the Blair-thing, it could easily send a piece of itself skittering off into the snow, as a dog, a person, or even a head with giant spider legs attached to it. Even if Childs and MacReady die as humans, then, a thing is left behind to be found. If all it needs to replicate itself is a single cell, then it's even simpler. But that doesn't need to be as horrific as it appears, right? As previously mentioned, it's unwise to assume the thing's true motivation. Perhaps it is just trying to survive, and it won't infect the entire human population 27,000 hours after it reaches civilization. Maybe all the deaths seen in the film are the result of panic, fear, and a gross misunderstanding. That would certainly be in keeping with the film's paranoid overtones. Maybe the thing just needs to feel secure enough to open up a dialogue with people, and it never has the chance with people like MacReady pointing flamethrowers at everybody and demonstrating an eagerness to use violence as a first resort when faced with the unknown. Maybe it just wants to build a new spaceship and go home, and if it gets to civilization, it can do that without having to assimilate more than a handful of people. Or maybe it's a galactic plague that spreads itself everywhere it goes and can never be truly stopped. I suppose that's possible too.